Any observer of the media today, be it newspapers, radio, TV or online media, could be forgiven for thinking that we are living in a very terrible time for humanity. We are fed with endless stories of war, corruption, natural disasters, terrorism, suicides and more. Even our modern obsession with celebrities seems more often than not to focus on their falling from popular favour, be it sporting heroes who are found to be taking drugs or politicians, singers, actors etc who are caught having affairs. We even enjoy our stories of bad luck – the millionaire who lost everything in a stock market collapse seems to be a popular news story too. Is it true that the world is just getting worse and worse? Surprisingly, actual data does not support this view at all. Max Roser is an economist at the Institute for New Economic Thinking at Oxford University. He makes his data available freely through the website www.ourworldindata.org. The graphs that Roser has carefully prepared reveal some interesting trends. In the late 1940’s, almost 600,000 people per year lost their lives per year in war. By 2007, that number had fallen to under 20,000, a fall of nearly 97%. These figures are even more surprising given the rapid rise in world population in that same period of time. In health, we see a surprisingly similar trend. Global deaths from major diseases have fallen rapidly. Deaths caused by malaria have fallen nearly 50% globally from 2000 to 2015. The success of global healthcare programmes in managing these major diseases and health problems has had dramatic results. Global life expectancy has risen from just 29 in 1770 to over 70 by 2015. India has seen particularly dramatic increases in life expectancy since Independence, with the average person living to 24 years of age in 1990 and 65 by 2011. We often feel that our lives are becoming harder and harder and that work-life balance is suffering as a cost of economic growth. However working hours per week in most developed countries have fallen by almost a third in the last century, and India is now starting to follow this trend. Meanwhile the economic growth is very real. In 1820, nearly 85% of the world population lived in extreme poverty. That figure now stands at around 20%. Roser’s data shows a particularly remarkable change in the percentage of world population living with less than $1.25 per day. This fell from over 50% as recently as 1980 to 20% by 2010. This reflects rapid economic growth and shows the relative success globally in ensuring that that wealth generation reaches the poorest in society. Terrorism is another focus of our media today, and it is true that the number of terrorist incidents has risen in the last few decades. These rises are dominated by periods of sustained terrorist activity in politically unstable regions such as Israel and Palestine. There is no doubt that any act of terrorism is to be condemned, and we should never grow so used to news of terrorism that we lose our motivation as individuals and as a society to combat the problem. The popular media would suggest, however, that there is a huge risk of terrorism for most of us in our daily lives. In fact, the risk should be seen in perspective. According to the international charity Oxfam, around 13,000 people died as a result of terrorism globally in 2010. This is the equivalent of 0.5% of those who died due to alcohol and just 0.2% of those who died because of tobacco. Politics is one area in which the media gives an undeniable impression that all is lost and the world is in a state of emergency, yet once again the data leads one to question this conclusion. While nobody can deny that there is corruption and malpractice in all systems of government, democracy is often thought of as the ‘least bad’ method of operating a country. If this is the case, then the political environment must have improved significantly as the number of people living in democracy has increased from almost none in 1816 to around four billion (just over half the world population) by 2015. There is a dramatic corresponding decrease in those living under colonial regimes. So if there has in fact been so much progress in the world, why do we get the strong impression of negativity by our consumption of popular media? The answer to this question could possibly be found in the field of psychology and the increasingly sophisticated understanding of it possessed by those in the media field. Since the vast majority of world media organisations are businesses, they are fundamentally driven by profit. They are bound by this to attempt to sell as much copy and advertising space as possible. This has generated a competitive market in which successful media organisations and personalities compete for a better understanding of the stories that will, and will not, grab our attention and persuade us to buy into their product. Why does it seem that being successful in the media requires a disproportionate focus on the negative? The need to survive – We have a very strong instinct towards safety. This motivates us to read stories about things that are a danger to us. We want to know what to avoid. The need to establish a group – Our basic tribal instincts are similar to other animals. We feel safer in our own group. This motivates us to read stories that help us to establish who is and is not in our group. The need to blame – We want to make sure that bad things that have happened cannot happen again, especially to us. This leads us to read stories that we feel help us to work out who is at fault and how we can stop them. The need to feel safe – We are often frightened by the world, and we seek comfort. This motivates us to read stories suggesting that a negative situation could not happen to us because we are somehow superior to those to whom it has happened. Given these instincts and the need of the mainstream media to appeal to our interests, it is no surprise that we see a majority of content suggesting that we are unsafe because of war, terrorism or natural disasters. We also cannot be surprised when we find stories that back up the notion that we can be safer if we find who is to be blamed for our insecurity. We feel still better if the person or people who are to can be shown to be outside our ‘tribe’ on account of their ethnic origin, gender, sexuality or religion. It is only natural that this leads to suggestions of protecting ourselves by distancing ourselves from these ‘others’. While the mainstream media cannot be blamed for commercial success, the bias that is evident in the content to which we are exposed creates a problem. It leads to a natural division between people, creating an environment that becomes competitive and communal. The logical conclusion of this is that we are more likely to respect those people in society who espouse competitive and communal values and solutions. In such a case, the media moves from being an observer and reporter of truth to a creator of it. What can be done to break this cycle of negativity, which is actually unnecessary and exaggerated? While it is right that we call the mainstream media to account for any fake news or inaccuracies in reporting, we cannot entirely blame a commercial entity for being commercial. In the same way that a food outlet will sell unhealthy food if that is what we wish to eat, so a media outlet will focus on whatever news we are interested in reading. As individuals we have a huge power to change the bias in our media by choosing media sources that give a more balanced view. If we are to have a wider effect on society and break the cycle of negativity, a more widespread strategy is needed. This is where positive news comes in. The concept of dedicated positive news is relatively new to Goa but is well known internationally. In England, there is a print and online magazine called Positive News founded back in 1993. It is a social enterprise owned by journalists and readers, and it has enjoyed great success over the years, bringing to the reader beautiful stories of positive change from around the world. Years ago, after a horrific incidence of Islamic terrorism in London, the mainstream media in England turned to a blame game following the initial ghastly scenes of devastation from the site of the attacks. Their particular focus was on Muslim leaders around the world. They felt that the Islamic community had not done enough to support counter-terrorism moves by criticising terrorism in the name of Islam. Not one of them reported that within hours a group of very senior Muslim leaders had indeed met and stated publicly that the violence that occurred could not be in the name of Islam and was contrary to the teachings of their faith. The story appeared only in Positive News. The Muslim leaders who had taken this heroic step were all from India. Needless to say, their heroism was not reported in India either. It was then that the great need for positive journalism in India became apparent. The inherent problem with positive news reporting is that it actively does not seek to attract us by appealing to our basic instincts. This puts it at an instant commercial disadvantage and means that positive news is unlikely ever to rival the major national media outlets in India or anywhere else. Though hugely necessary, positive news cannot be run on a business-for-profit model. This makes it impossible to consider seeking the level of funding that would be needed for an India-wide publication. 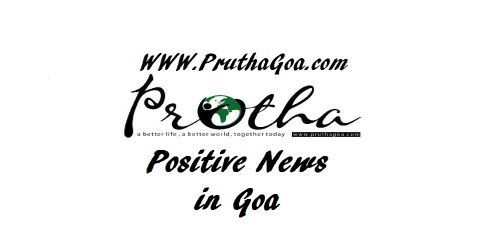 By focussing on Goa, www.pruthagoa.com aims to bring to a local audience the positive stories that are having an impact on our daily lives. Prutha was launched over three years ago as a partnership between the Xavier Centre of Historical Research, Porvorim, and the UK based company Volunteering Goa Ltd.
From the start, the core of our website has always been our regular articles on aspects of positive change and social work. They are published at least weekly and appear as headlines on the site. The articles are promoted on all forms of social media and debate as well as the sharing of ideas based on the varied content covered is encouraged. There are more than 250 articles on subjects as diverse as theatre, the environment, NGOs, food, business, art, and music. They provide an uplifting catalogue of all the wonderful things that are being done by companies, individuals, government and charitable organisations across Goa. The website is supported by an advisory panel consisting of Isabel de Santa Rita Vas, Dr Luis Dias, Miguel Braganza, Valmiki Faleiro and Manguirish Pai Raiker. The cooperation and support of the staff and management of Xavier Centre has been a vital link in our work and special thanks are due to Fr Savio Abreu SJ and Fr Apollo Cardozo SJ. Prutha has more recently started featuring events in Goa on the site. Upcoming events appear on the home page and there is a direct link to a calendar of events too. Engaging students from the BSW and MSW courses of Don Bosco’s, Panjim. Students will be asked to share positive news that they come across using our social media platforms, blogging or even writing articles. This will provide excellent experience for the students and will hugely increase the breadth of material on Prutha. There will be an annual function for all the students, with prizes presented to those who have contributed most over the year. Improving the main website. We will be looking to take on a professional IT input, especially in the area of web design. This will improve the appeal of the website through a more attractive and user friendly design and fewer technical glitches. Publication. We are very committed to online media as the future of journalism and especially because it allows us to offer all our material freely. In the future we may look to partnership with a local magazine so that our articles could be available as a dedicated positive news insert and therefore be available to those who prefer their news in print. Funding. The continued sustainability and growth of Prutha depends on long-term funding. We acknowledge that positive news is unlikely to be commercially viable on a profit making basis so we are looking at partnerships with individuals or companies looking to make Prutha part of their CSR activity. Your ideas. Prutha will always be an interactive resource for Goans everywhere. Thank you for being a part of that by your presence here today and please do discuss your questions and ideas now or by contacting us in the future. *This article is based on a talk given at the History Hour of the Xavier Centre of Historical Research.